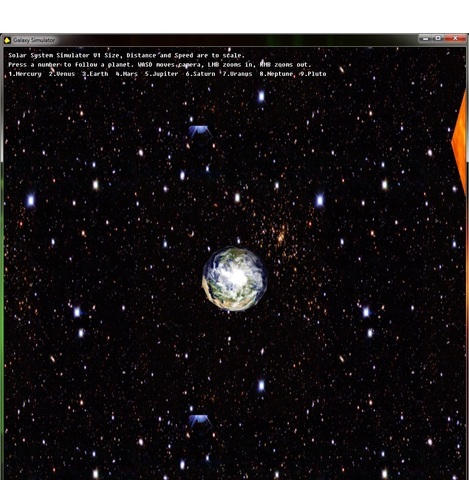 I'm making a Solar System Simulator. Eventually, its just going to be a screensaver type thing, but at the moment it is very basic. Press a number to follow a planet. WASD moves camera, LMB zooms in, RMB zooms out. You've exaggerated the size of the bodies quite a lot! I realise you want the planets to be visible and in proportion to the sun, but the sun is almost as big as mercury's radius here! are you sure the scale is right? I remember I once made a solar system model to scale and my planets were so small and sparse when compared to the sun that real scale seemed a little ridiculous for my purposes. everything else is nice though. good control functions. I'd maybe use the scrollwheel for zoom and mouseclick drag for camera move. I just find myself trying to use the scrollwheel for the zooming when playing with it. Quote: "So the thread wont get locked"
Where are you getting your "facts" regarding the size of things from? will get you a pretty smooth sphere. Quote: "i wanted it to be to scale that how big the sun is! i know its hard to see them and ive changed it so you have good camera controls. ill upload the changed version in a few mins"
Sorry I have not tried it yet, screenshot would be handy for those who have not downloaded. Seems to me that you should be able to test sizes by putting the camera on the earths surface, the sun and moon should be roughly the same size and that size should be familiar to what we see in real life, is this what you get? my bad... uploading screenshots now.